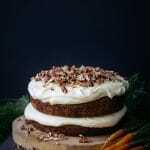 An ultimate, luxurious, carrot cake ladened with pillowy dreamy cream cheese icing and scattered with crunchy pecans. Some might think this a perfect cake to serve at Easter. Well, I thought the same and I thought it would be lovely for you all to serve it at Easter time and the little bunnies would love it. But…..as per usual Kate style, I am late at posting the recipe! The plan was to have it up for you two weeks ago in time for Easter but now let’s just say this is the perfect cake for autumn (or spring for all my lovely Northern Hemisphere friends) and just pretend that was what I always intended! 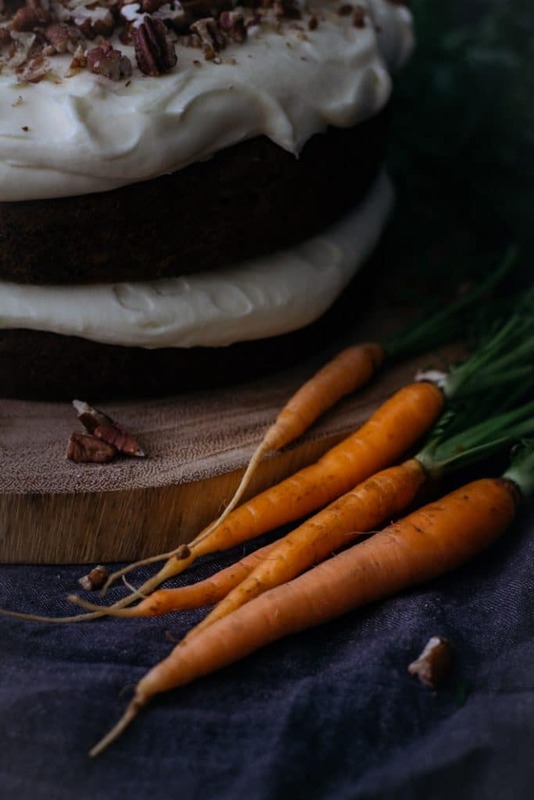 Growing up carrot cake was always my absolute favourite cake. It was my go-to whenever I saw it on a menu or in a cabinet at a cafe. Along with chocolate cake (the crowd favourite) it was also my go-to for baking at home. If you’re like me and grew up in the 80’s and 90’s you’ll probably remember having a microwave cookbook. My brother and I thought it was pretty darn cool to cook just about anything in the microwave, it was still somewhat of a novelty you see – casseroles, scrambled eggs, brownies, self-saucing chocolate pudding anyone? Of course, my favourite was a carrot cake. It was always cooked in a ring mold and was moist and fluffy. However, looking back now I am a tad skeptical of my teenage tastebuds and really how good a carrot cake cooked in the microwave could actually be. 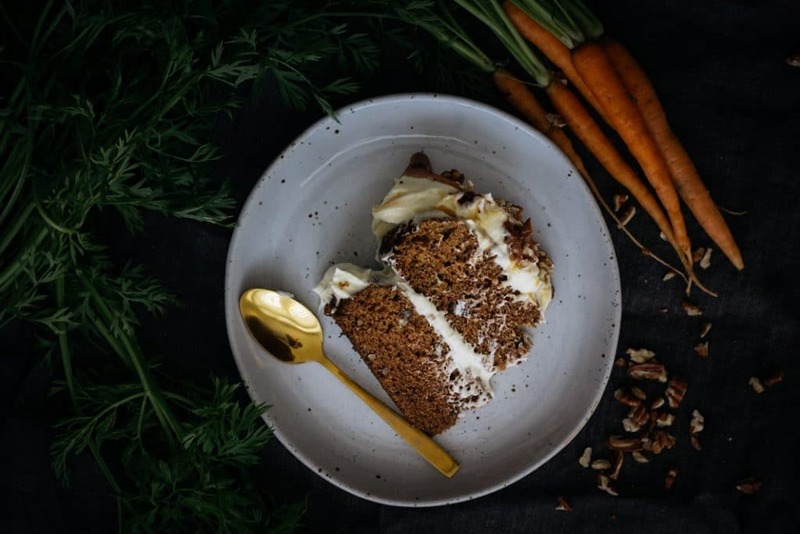 I haven’t tried a microwave carrot cake in about 20 years and I don’t even have anything I could cook one in these days so this cake today is firmly in the oven baked category. There’s no need to deviate from this one because it is simply the best. I would like to claim it all to myself but it’s actually an adaption of one by one of my favourite Kiwi cooks – Annabel Langbein. There’s just no point trying to mess around with it and make it better because I just don’t think you can. It always turns out, it’s always fluffy, it’s always spongy and the absolute best part is that it can all be made in the food processor. Goodbye lots and lots of dishes! 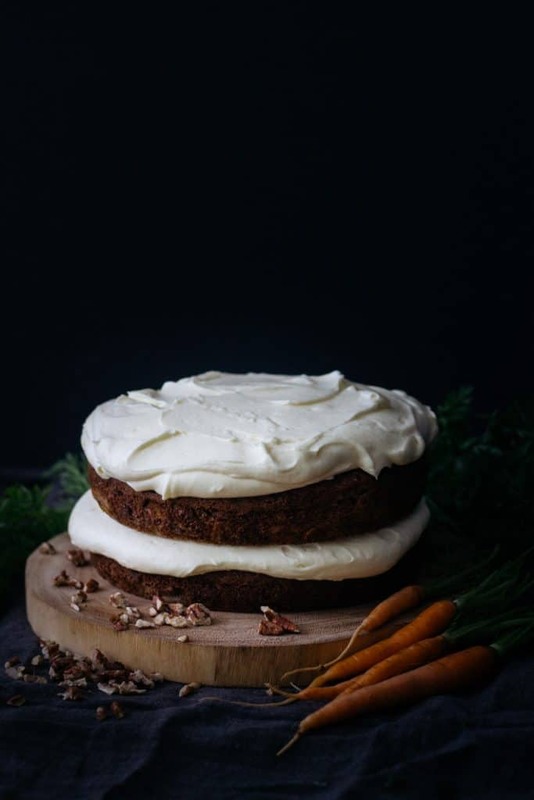 I did mess around with it a little by adding some pecans (or you could choose walnuts or hazelnuts which are also lovely) and amping up the cream cheese frosting factor because let’s face it, we all really eat carrot cake for the cream cheese frosting. That being said, the cake is seriously laden with cream cheese frosting, I’m warning you now there is a lot. 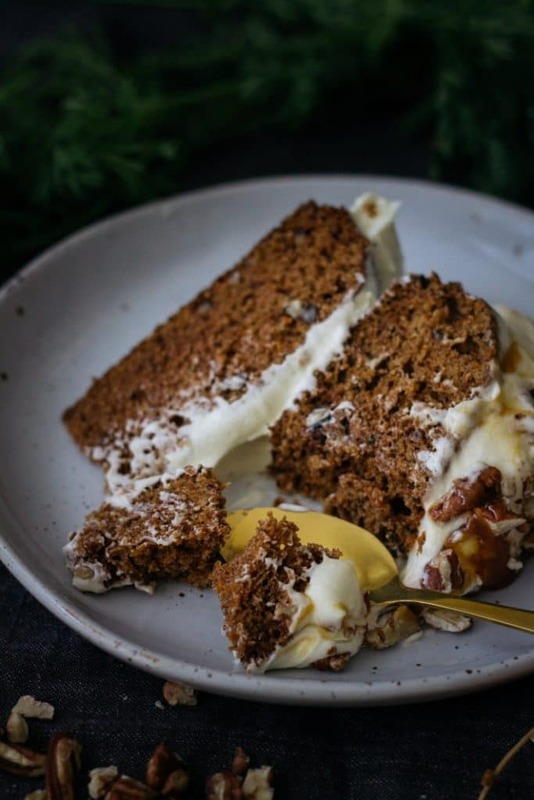 Maybe it’s a Tuesday and you’re not feeling super decadent then feel free to halve the cream cheese icing recipe and I guarantee you’ll still have enough frosting. In the picture’s you’ll see some gorgeous and picture perfect looking baby carrots. My son thinks these are such a treat (don’t worry they still don’t compare to chocolate on the treat scale) and loves them in lieu of his regular carrot sticks. However, these were definitely not used in the cake! $$$ Instead I used a bag of carrots called the Odd Bunch. I just love these (and I’m not being paid to say that)! In an age of massive worldwide food waste that’s making a significant contribution towards global warming (I read that if we eliminated food waste it would have the equivalent on the environment as taking one in every four cars off the road) choosing products like this can play a small part in helping our world. This is a big (and extremely cheap) bag of the carrots no one ever wanted. They are a little bit ugly, a little bit wonky but taste fresh and delicious just like full-priced carrots. More and more supermarkets are making these less than loved vegetables available and there’s even a company in the states that’s started a delivery service so, if you can, I encourage you to seek them out – your wallet and planet will love you for it…and I will think you’re even cooler than you already are! 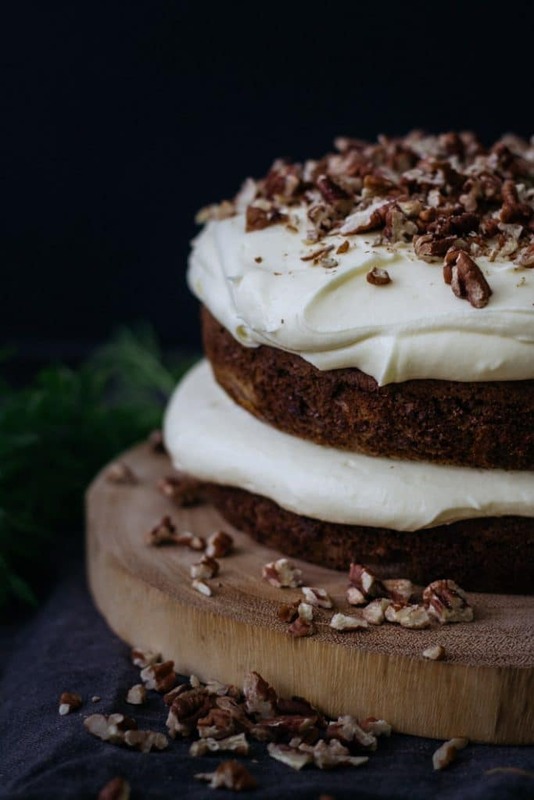 A spiced layered carrot cake with toasted pecans and mountains of pillowy cream cheese frosting. 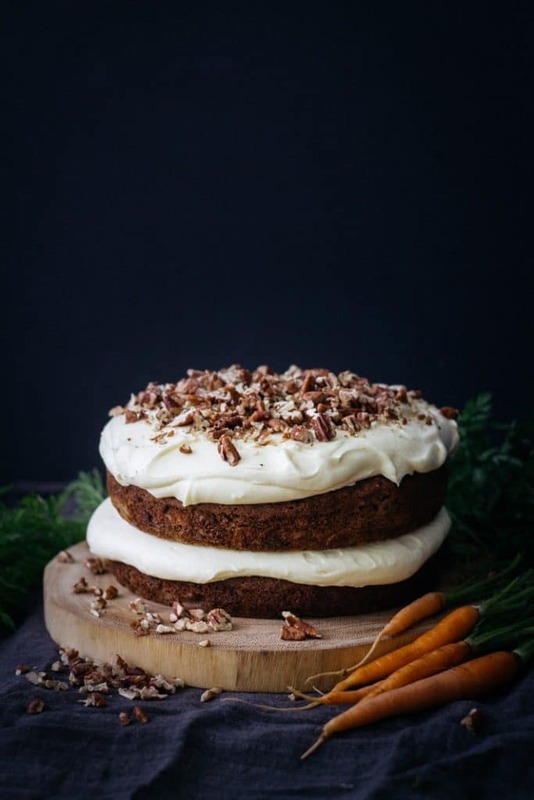 Your new favourite carrot cake is so easy, the whole cake is made in the food processor! Preheat oven to 160C/325F on bake. Grease and line two 20cm/8in cake tins. Either grate carrots by hand or fit your food processor with grating attachment. Grate carrots, remove from food processor and set aside. Fit food processor with blade attachment (don’t worry if there are a few pieces of grated carrot stuck to the sides). Place oil, sugar and eggs in the food processor (or mixing bowl) and mix to combine. Add wholemeal flour, plain flour, salt and spices. Add back in the grated carrot and pulse (or mix) until just combined. Be careful not to over mix. In a small bowl, mix together the baking soda and orange juice until the baking soda is dissolved. Add to food processor and pulse until just incorporated. Divide evenly between two tins and bake for about 40-45 min or until a skewer comes out clean when inserted into the cake and the cake is springy to the touch. Leave cake to cool in the tins for 10 min before turning out and allowing to cool completely on a wire rack. 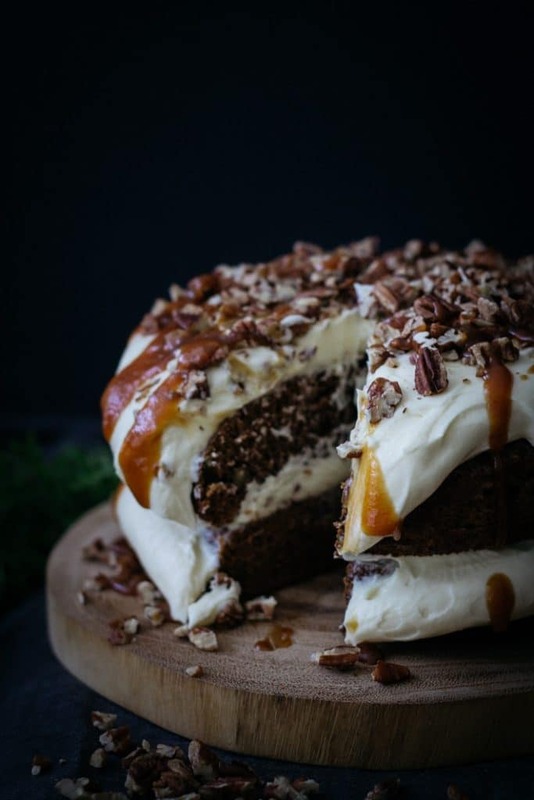 While the cake is cooling, make the praline pecans and cream cheese frosting. To make the cream cheese frosting and place butter in the bowl of an electric mixer. Beat for 3-5 minutes until light and fluffy. Add icing sugar one cup at a time until fully incorporated. Beat for another 3-5 minutes until light and fluffy. Add lemon juice and mix to combine. If cakes have a slight dome, use a serrated knife to cut off the domes to give two even cakes. Spread one cake with half the cream cheese frosting. Top with the second cake and spread with remaining frosting. 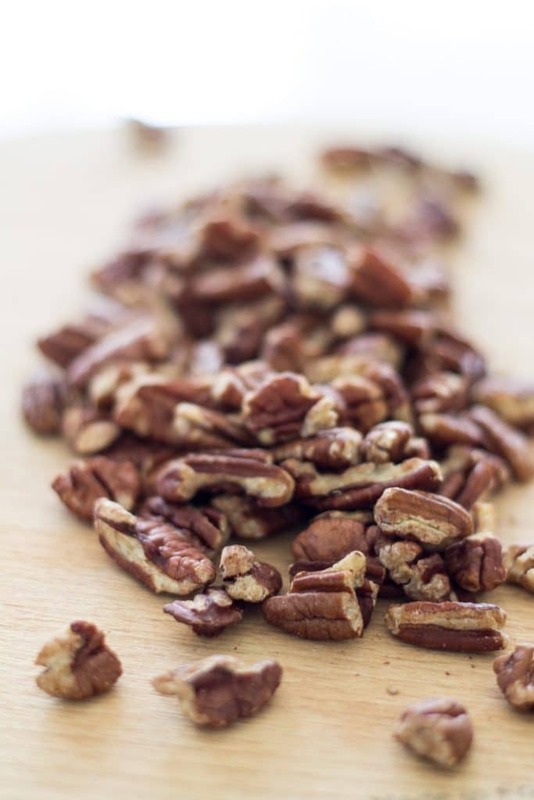 Sprinkle over chopped toasted pecans and serve. Drizzle with caramel sauce, if desired. The cake is best eaten on the day of decorating, however, an unfrosted cake will keep for up to 1 week in an airtight container. Recipe adapted from Annabel Langbein.